As we move from an industrial economy to an information economy we are dealing with much greater complexity. That's what this video is describing. Read about The Complexity Challenge. 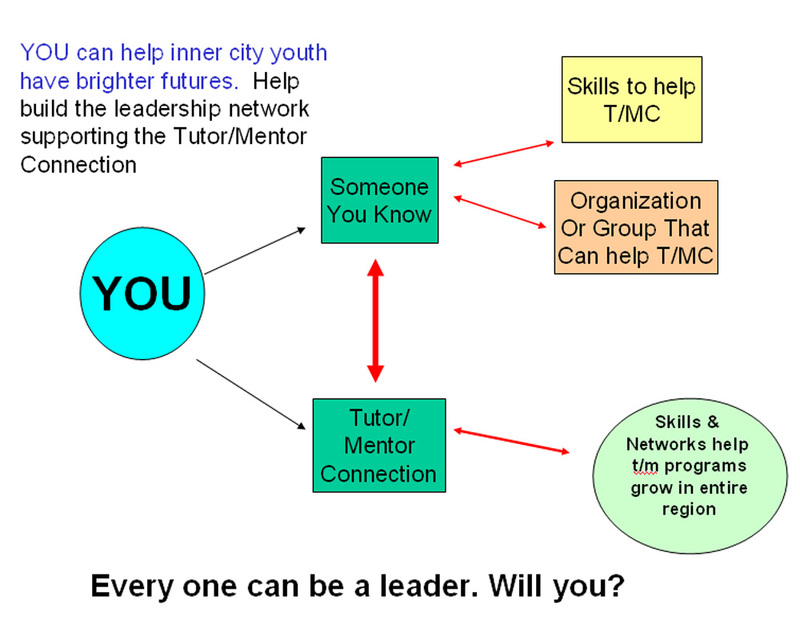 As you read about the role of leaders in complex industries, look at this graphic and how the information that we share on this blog and Tutor/Mentor Institute web sites can support the involvement of many organizations in actions that build systems of support for inner city youth. In this article "Malcolm Gladwell says that if you want to shine, put in 10,000 hours." In the article above the author says "transform or don't survive". This is a critical issue for business leader. While I'm sure many companies are spending millions of dollars on training programs, learning these skills requires motivation and hands-on experiences. My own learning and thinking has come from my 17 years involvement as a volunteer while working for the Montgomery Ward Corporation in 1973-1990 then the past 20 years as leader of a non profit. My motivation to learn is driven by my passion for the cause. It's never been the paycheck. If companies are looking for competitive advantage, or ways to survive in this new complex knowledge economy, why not encourage employees to learn to manage complexity through the volunteer roles they take with social sector organizations who are using the most recent business technology to support the learning and involvement of staff and volunteers in their organizations. Embed the Tutor/Mentor Institute in your organization and let us help you develop this strategy. In a previous article I wrote about MOOCs, or massive on-line organized learning communities. These are part of a series of articles focused on learning. When we created the Tutor/Mentor Connection in 1993 our aim was to "collect and organize all we could find related to volunteer-based non-school tutoring/mentoring" and how such programs could contribute to workforce development and social justice. This chart illustrates the range of ideas we've been collecting and adding to web libraries. This link points to one of four sections in our library. While universities, libraries, think tanks and many other organizations collect and organize information, the Tutor/Mentor Connection also seeks to actively share this information with anyone who cares about poverty, racism, education, wealth gaps, social justice, democracy, etc. The goal is that as more people become personally involved and understand the infrastructure needed to operate and sustain long-term connections between programs, volunteers and inner city youth, more people will be proactive in seeking out places to offer time, talent and dollars. This video illustrates the year-round strategy we've developed and this chart outlines the public awareness strategy we've been trying to implement. Unfortunately we've never had much money to invest in what we do. Yet our network keeps growing each day. These are some awards that have recognized my work. Imagine what we might do to bring thousands of people to this knowledge in an on-going MOOC focused on helping tutor/mentor programs grow --- if we had a greater wealth of resources. 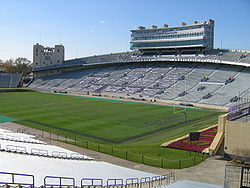 This is Ryan Field at Northwestern University. It's one of thousands of buildings at universities, hospitals, sports stadiums with the name of a benefactor or sponsor who has put up millions of dollars for that privilege. 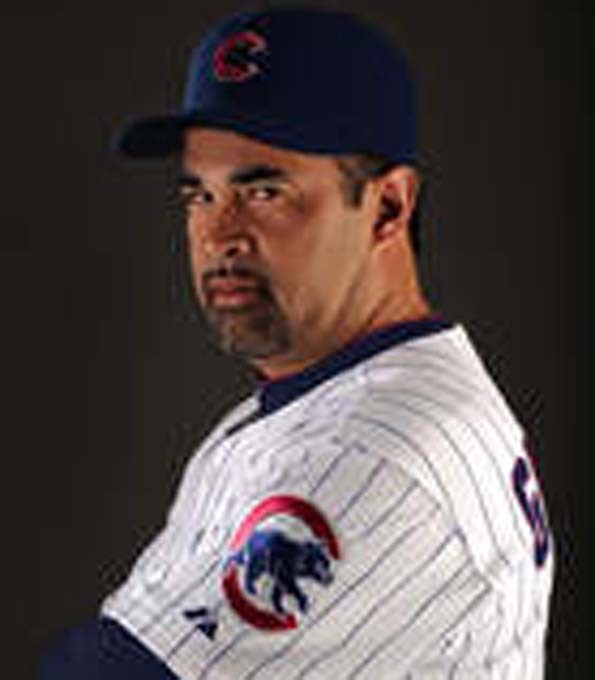 While I enjoy football and baseball I think we'd all benefit from working together to help more kids born in poverty be in jobs and able to support their kids when they are adults rather than in prison or living in high-poverty neighborhoods. Thus, I offer the Tutor/Mentor Institute, Tutor/Mentor Connection, or a component of our work, such as the conferences or the tutor/mentor program locator, as a "naming opportunity" for someone who wants to help us make this a better world for all of us. If you search for the words "tutor mentor" on Google or most other search engines our sites come up multiple times on the first page. You'd need to spend quite a bit of money for that ranking. We already have it. You can too. Contact me on Skype at "dbassill" or join the Tutor/Mentor Institute on Facebook. Like to change the subject? Instead of talking about losing a big game or becoming manager of another team, wouldn't it be great to be able to point reporters to how you're helping inner-city tutor/mentor programs grow? Read the Sports articles on this blog, like this one, and see how athletes can become the cheerleaders who mobilize fans to be volunteers, donors and/or leaders in tutor/mentor programs all over the Chicago region and in their own home towns. Anyone can be a leader and point volunteers and donors to tutor/mentor programs in different neighborhoods of a city .... as long as someone makes the effort to create and maintain a Tutor/Mentor Program Locator Directory like we have done since 1994. The most important part of this idea is that we're pointing to all of the non-school volunteer-based tutoring and/or mentoring programs we know of, not just the high profile programs with brand names or celebrity leaders. 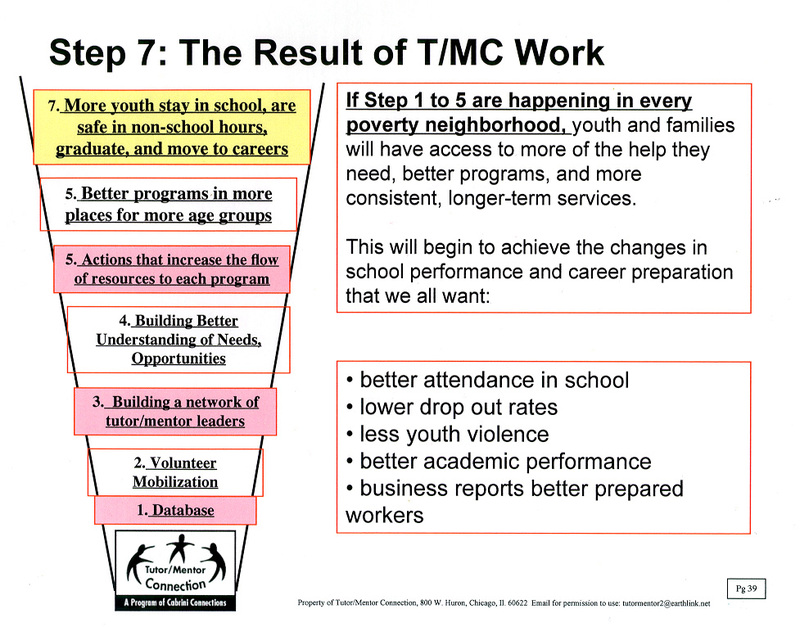 We're using maps to illustrate this need for tutor/mentor programs in all high-poverty areas. We need your help to continue to operate the program locator and to update it with new features and more current information. This is a social investment, not a charitable donation. If you want "naming rights" we'd be happy to talk with you. Last week the Chicago Tribune included an article about Mayor Rahm Emanuel's first 100 days. 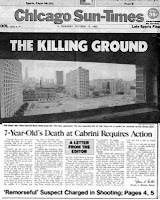 Today's Chicago SunTimes has a 100 day report on the Chicago Police Department since Supt. Garry McCarthy took command. In June I posted this article using a graphic I created to illustrate how the Chicago plan might be improved by using maps and graphics. This this short PDF articlePDF expands upon this idea. Browse the various past article on this blog and you'll see many more visualizations and examples of how maps could be used. I'm in the middle of my own FIRST 100 DAYS. 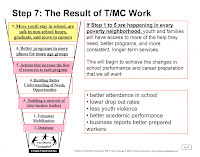 I created the Tutor/Mentor Institute, LLC in mid July to provide a new structure to generate ideas like these and to mentor leaders into strategies that might support the growth of mentor-rich non-school k-16 programs in all of the high poverty areas of Chicago or similar cities. 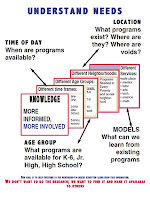 My goal is to "Embed" myself and the ideas on the Tutor/Mentor Institute web site and this blog in the planning and strategy-making of many cities and organizations while providing direct support to the Tutor/Mentor Connection and its efforts to support the growth of tutor/mentor programs in Chicago. If you can introduce me to others who might want to incorporate these ideas in their own strategies, or help me develop the mapping and visualization tools we show on the sites, please do. If you want to connect with these ideas join the Tutor/Mentor Forum or just post an introduction here. 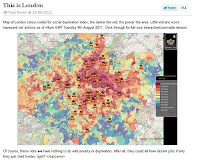 Gary Slutkin who is founder of CeaseFire and based at UIC wrote this article for the Guardian, a UK newspaper: "Rioting is a disease spread from person to person – the key is to stop the infection"
I had posted this map showing London riots on my mapping blog a few days ago. I've created concept maps to show strategy and to show the long-term work needed to help youth born in poverty move through school and into jobs that enable them to live adult lives free of poverty. I've hosted conference in Chicago every six months since 1994 and I've invited the Mayor, CPS leaders, CeaseFire and other leaders in Chicago to attend and to use the T/MC resources in their community organizing. I've also invited these leaders to help me find the financial supported needed to keep these resources FREE to Chicago. In this difficult economic environment collective action intended to generate resources for all of those needed in this work just is not happening. The next conference will be on November 4 at the Metcalfe Federal Building. I hope those who want to focus on prevention efforts will participate. If you'd like to provide the financial support needed,use the PayPal on this page. 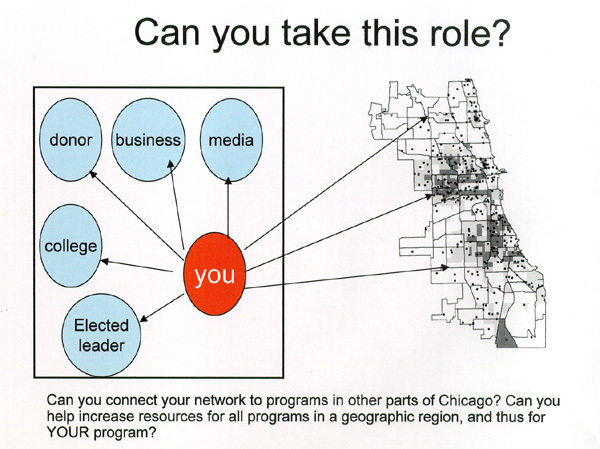 In 1995 the Tutor/Mentor Connection began to organize an annual Chicagowide Volunteer Recruitment Campaign intending to help all programs in the city and listed in the Tutor/Mentor Directory get volunteers and donors. 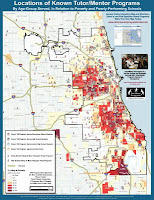 This photo shows how the Big Brothers/Big Sisters Program of Metropolitan Chicago was part of that effort. Between 1998 and 2002 we received a $26,000 per year grant that enabled us to hire a part time Recruitment Campaign Coordinator. 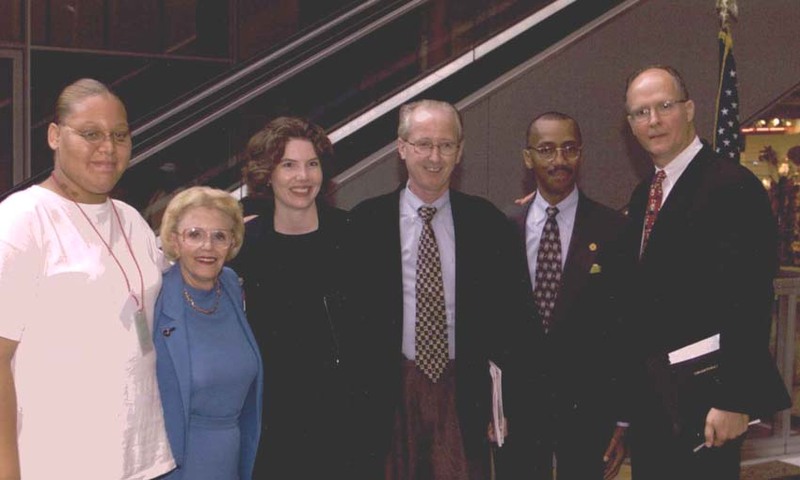 Through his effort the campaign grew to include Mrs. George Ryan as honorary chair, and leaders like Paul Vallas, CEO of Chicago Public Schools, as speaker at campaign press conferences. This link shows the Campaign Manifesto from one of those years. We don't do a printed Directory any longer but have created a map-based Program Locator that can be searched by type of program, age group served and zip code. We've tried to enlist financial support from foundations, businesses, the Mayor and other leaders for this strategy but with inconsistent success. Even when we've found a major donor the terrible economy of the past decade has caused many to cease giving after one, two or a few years. Yet the violence has not gone away, schools are still not able to change the aspirations and motivations of too many kids who come to school unprepared to learn and there are too few well-organized volunteer-based tutor/mentor programs in most Chicago or suburban neighborhoods. Too few leaders have this strategy in mind when they talk of improving schools and improving the workforce. Due to a lack of funding the Tutor/Mentor Connection no longer exists as a non profit structure. I've created the Tutor/Mentor Institute, LLC to continue to support the T/MC services in Chicago. My hope is that big and small investors will see what we're trying to do and see how this strategy can also apply to other cities and will support us with time, talent and dollars. Yet, while we seek support, all tutor/mentor programs throughout the region are now searching for volunteers and donors to support their efforts, too. While each program has limited funds for advertising, business, media, sports celebrities and elected leaders can adopt these leadership ideas and help create the advertising needed to attract and motivate volunteers and donors to browse the Program Locator and get to know the various tutoring and/or mentoring programs operating in the region. They are all different. Some are better than others. They call can grow from good to great if enough people make the commitment to help them. Today there's a report of a pregnant teen being shot and killed in Chicago. Does that make you mad? 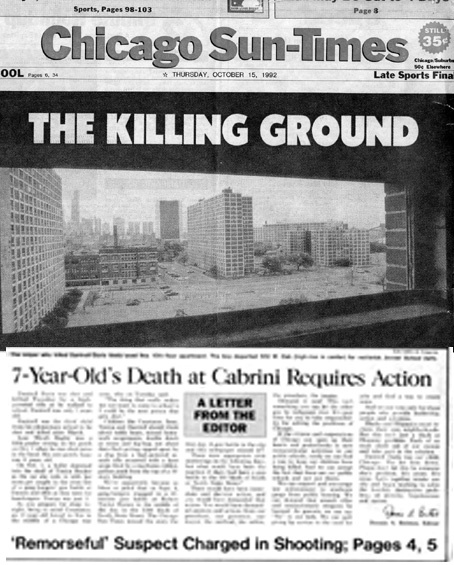 This picture is the front page of the Chicago SunTimes from October 1992. I've used it often to remind me and others of why the Tutor/Mentor Institute and Tutor/Mentor Connection exists. In July 2011 I created the Tutor/Mentor Institute, LLC. It's not a non profit. It is aimed at making a difference in the world. It needs your help. Social Investing is a new concept. Here are some excerpts from two sites which are trying to raise money to support social innovators all over the world. "I'm confused. Why do you call this an investment? Because it's important to distinguish this from charity. This is impact investing. Investors are being asked, and offered, the chance to make a personal and emotional connection -- an investment -- with a company. A social entrepreneur is being asked to make a reciprocal promise to its investors -- that it will use the investment to create greater value. It's an ongoing relationship, they're in this deal together." "Q: Is my financial support tax deductible? A: Unless otherwise stated, your support is not tax deductible. However you will get some awesome rewards, and the even more awesome feeling of helping someone start good!" Here are two other sites where donors are contributing to organizations and/or causes that do not have non-profit status. GiveForward - "empowers friends and family to send love and financial support to patients as they navigate a medical crisis"
At some point I may describe the different projects of the Tutor/Mentor Institute and Tutor/Mentor Connection on one of these portals. But for now I've created this page and I invite you to invest in the vision I've outlined in these blog articles and my newsletters for the past 18 years. If you've contributed to the Tutor/Mentor Connection in the past I hope you'll continue to invest in the Tutor/Mentor Institute so I can continue to support the T/MC in Chicago. But I hope you'll also invest so I can help similar structures grow in other cities. We need volunteers to help in many areas, or the money to hire staff. 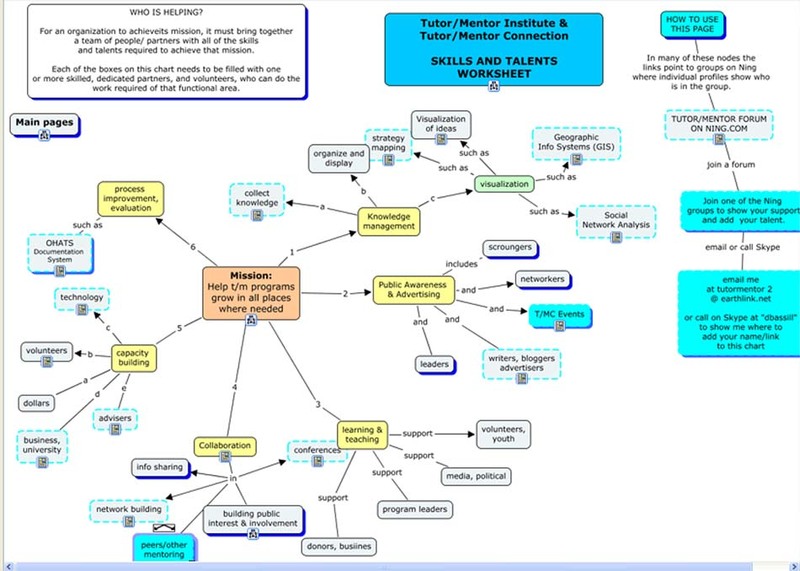 The talent map below illustrates the range of skills needed to implement the vision I've outlined on our web sites. With your help we can fill this map with names of people, organizations and businesses who share ownership of this vision and work responsibly and creatively to achieve its goals. 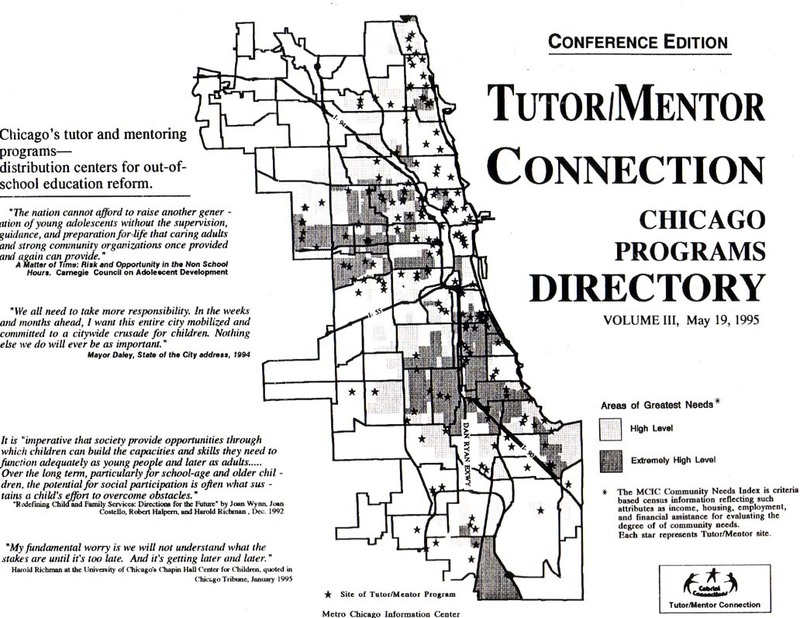 Since 1993 I've been trying to build a master DIRECTORY of all of the non-school volunteer-based tutor/mentor programs in the Chicago region. I've been plotting this information on maps, and have created an Interactive Map-Based Program Locator that anyone can use to see the distribution of existing programs and to find contact information for specific programs. 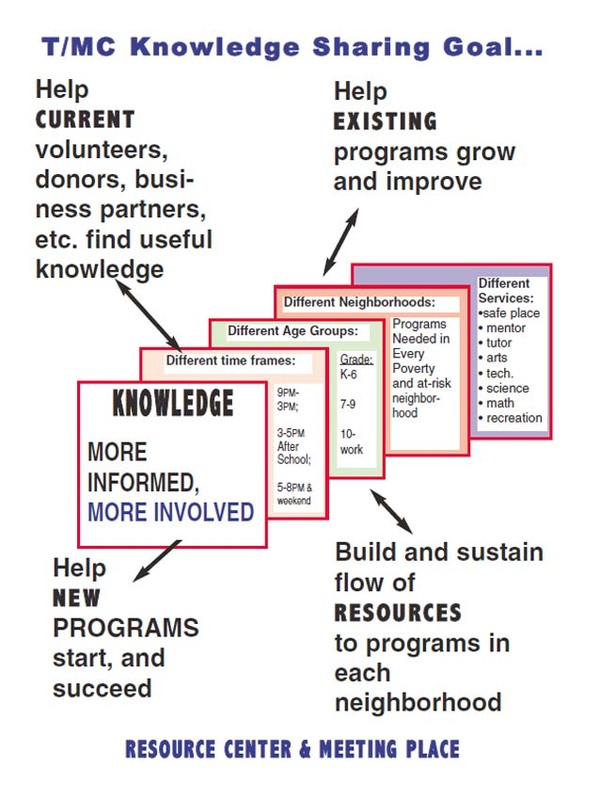 This information needs to be updated each year and we need to build a much deeper understanding of what each program does and the differences between different programs. With this we also need to create communications and public education programs that draw volunteers, donors and other types of support directly to each program the way corporate advertising draws customers to retail stores every day. I've never had the money to do this. Instead, my goal is to create shared ownership and a network of volunteers and partners who each have knowledge of the entire system, but expertise in local areas. For the past two years a class at DePaul University has divided the city into sections and worked to build and share an understanding of what tutor/mentor programs are in different sections and where they are most needed. In our Tutor/Mentor Connection forum we've created a list of "things to look for" when visiting, or building, a tutor/mentor program web site. In you can read how interns working with us are trying to communicate what they are learning about the Tutor/Mentor Connection. Building this type of knowledge and understanding could be the role of a service-learning team in a high school or college. It could be the volunteer project of a corporate or faith based team. It could be the role of a local intermediary organization. 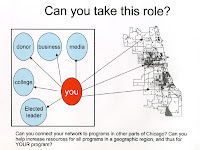 If you want to take this role I can add you to one of our network maps, showing who is taking ownership of the DIRECTORY in different parts of the Chicago region. 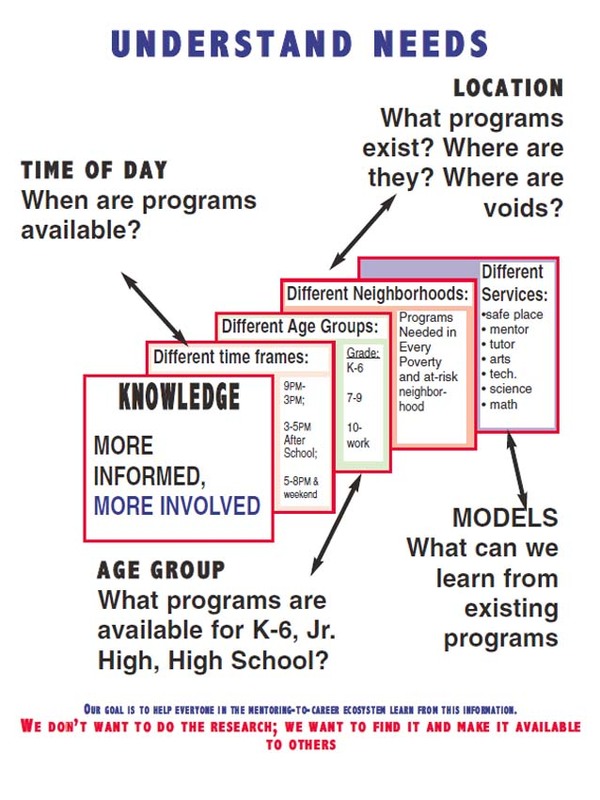 If we can build ownership in different sections the quality of information will be greater and it will be used by more people to help make tutor/mentor programs available to youth in different sections of the Chicago region. No one can do all of this on their own. Yet the value of what a few of us create can benefit everyone in the entire Chicago region. As a result I expand my network and my understanding of what I'm doing, by hearing it described in new ways by new people I'm introduced to. Today a post on this forum included this message: "The theory of change: personally I like the Margaret Wheatley theory of emergence that we find in Daniel approach (even if he don't know it. 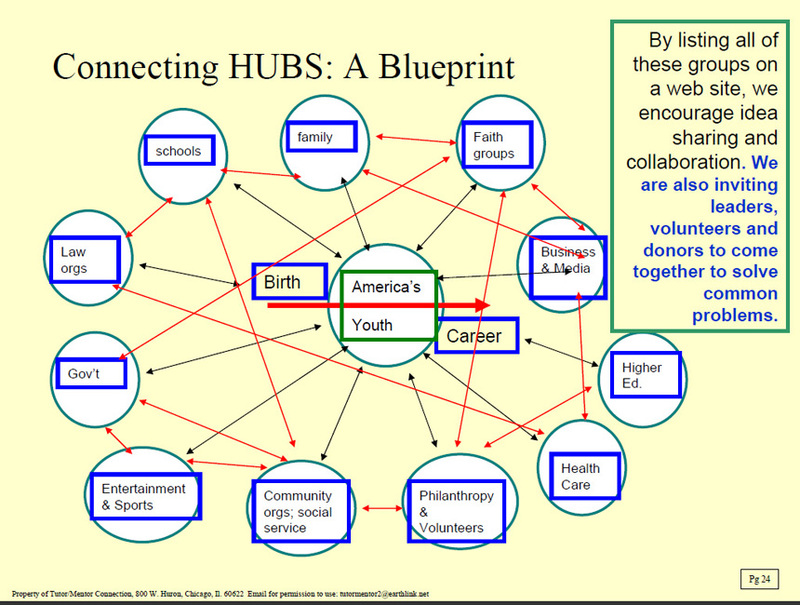 The writer pointed to this PDF by The Berkana Institute, titled Using Emergence to Take Social Innovation to Scale. As the writer said, I did not know of this. I do now. As you read this take a look at the Tutor/Mentor Institute's "Four_Part Strategy" and see how much what I have been building since the mid 1970s fits with this idea. Today's bad news headline is " 6-year old girl shot to death.". I did a Google search to see what articles I could find about the "cycle of poverty and violence" to add to my own library of information on this topic. I found this video. It could be Chicago. It's Hartford, Connecticut. "How can people not care." What must we do to engage more people in ways that they become personally involved, and stay involved with time, talent and dollars for many years and in many cities? Welcome to Monday. This is how I start my Tutor/Mentor Institute week. Hope you'll join me in looking for answers. I was surprised when on page 18 I saw Cabrini Connections listed as a model. I was pleased because this on-going learning has been part of the elearning and technology strategy that I had championed in this organization for many years. This is pretty much on hold right now due to loss of our major donor due to economic reasons. However, the reason I'm really excited to be in this White Paper was its emphasis on creating community information and stimulating on-going learning as a result of volunteering and service involvement. One group that was profiled in this White Paper was the Bonner Foundation, which "promotes the use of social media tools, such as wikis and videos, by all of its scholars. I started putting my planning documents on wikis and on web site presentations more than a dozen years ago. However, the challenge I've found is helping people find the time and motivation to read these and become personally involved by editing and contributing ideas. I was invited to be a contributor on the ACT NOW Drop Out Prevention wiki many years ago. I wonder how many other people use this? I'm also part of many on-line forums where ideas are shared and networks built. One of the five strategies of the White Paper is to "Generate Public Relational Knowledge." I've been piloting ways of doing this with maps, graphics, and network analysis tools, yet have never found enough people who really understood the value of this who were willing to invest the resources needed to build this. In the White Paper Carmen Siranni's book, "Investing in Democracy" is quoted saying "you cannot get community summits and other forms of excellent engagement on the cheap. They take a long-term effort and resources that are normally a mixture of money, policies, and people's volunteered and paid time." I've created the Tutor/Mentor Institute, LLC to expand the ways I attract revenue and build partnerships so that I can do more to continue to develop the tools and resources we've been working on for more than a decade and make them available to more cities than just Chicago. 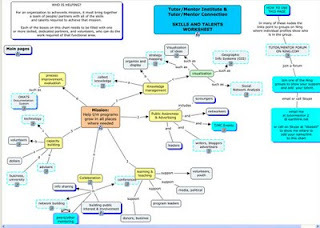 This talent map shows the skills I need and some of the people I'm learning from. If you want to be part of this map and an investor/sponsor of this process, please introduce yourself here or on the Tutor/Mentor Forum. School starts in a few weeks and every volunteer-based tutor/mentor program in Chicago, New York, Dallas, LA, etc. is ramping up efforts to recruit volunteers and other support needed to operate. However, very few of the mentoring programs in America have the power and influence of Big Brothers, Big Sisters, who can run professionally made radio ads and recruit volunteers for their programs. Most of the small programs don't have the resources to do this. So what do we do. I presented the information in this PDF to an advertising class at Loyola University Chicago in April and at the Tutor/Mentor Leadership and Networking Conference in May. It shows how each of us has personal power that we can unleash through social media and one-on-one network-building. 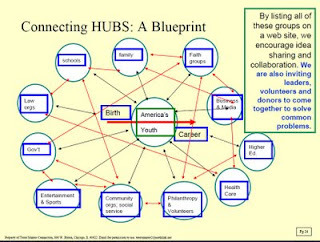 What if volunteers, staff, students and leaders in neighborhoods across the country mounted a social media campaign aimed at enlisting 1% of the richest people in America to become deeply involved in helping tutor/mentor programs grow in high poverty neighborhoods. This Chicago Tribune report, shows the "wealth gaps between whites and minorities have grown to their widest levels since the U.S began tracking more than 25 years ago." 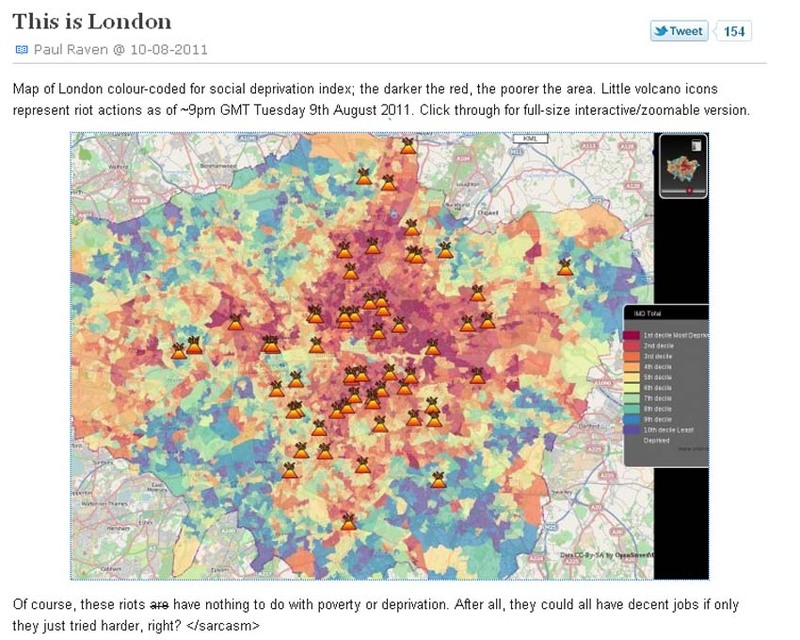 This link points to charts that demonstrate the growing gap between rich and poor. What would it take to recruit volunteers from affluent backgrounds and keep them involved for dozens of years so some become as committed to this cause as I have become in my own 35 years of involvement? 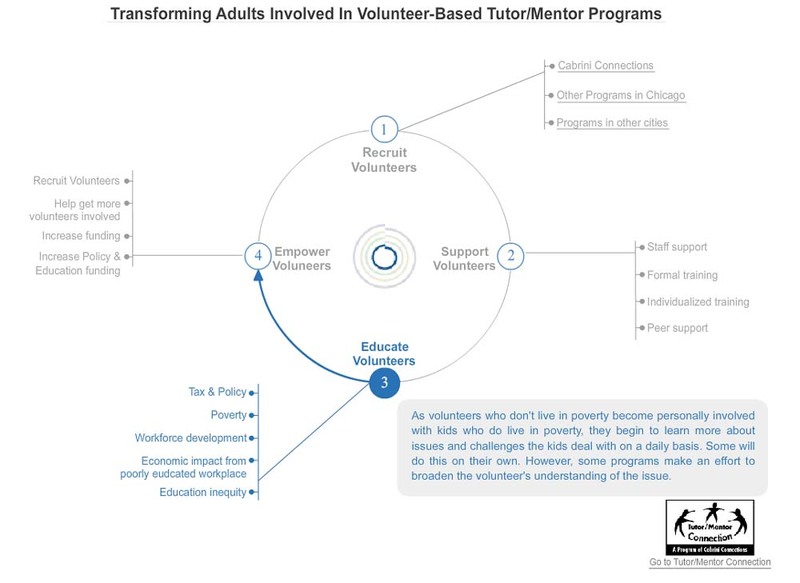 The graphic at the top of this page illustrates the role thousands of people could take to expand the number of people who become involved in tutor/mentor programs. This graphic is from this video. It shows how people who stay involved longer become more personally engaged, and do more to help a youth succeed in life. Some of these people could do much more to make tutor/mentor programs available if they were from the 1% of the wealthiest people in the country. Read more of the ideas we share via this blog. Help us share these with an ever-expanding network of people. Take ownership of these in your own community, company, faith groups and social network. Together we can connect those who can help with those who need help and through this we can build bridges from poverty for those who are now isolated on islands of inner city poverty.